Designer Daren Cook explains how he created the cover for Ken Follett's new novel A Column of Fire, and subsequently, updated the covers for the entire Kingsbridge series. 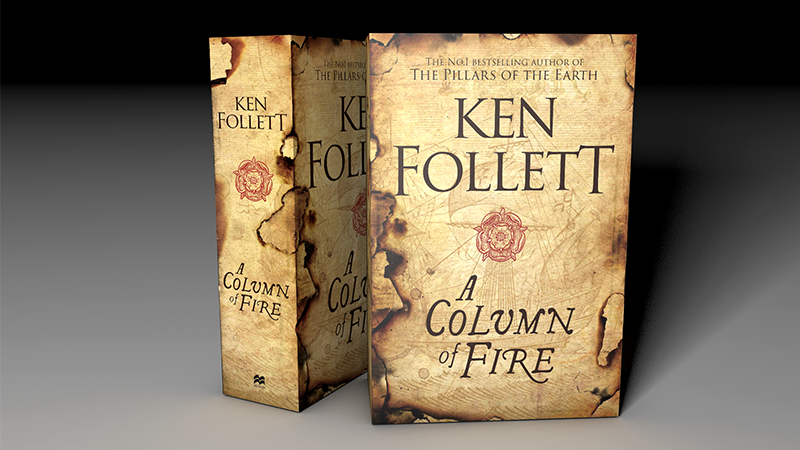 I was thrilled when Ken Follett and Pan Macmillan asked me to design the cover for A Column of Fire. I was familiar with The Pillars of the Earth and World Without End, and the opportunity was too good to miss. I started by reading the draft outline version for A Column of Fire to get a good grasp of the story, I also went back to the previous two books for inspiration (content and covers). We all agreed that it would be interesting if this cover could feel more like an artefact from the novel, rather than just an illustration of its contents. So the elements I chose to visualise all help locate the cover historically. The novel is set during the Elizabethan period, so the Tudor Rose is an obvious central graphic. The title is set in a font based on the original type used in Shakespeare’s First Folio. It’s slightly naive treatment helps locate the cover historically too. As I read through the draft, I was consciously trying to identify a suitable visual to define A Column of Fire in the same way that the image of Kingsbridge Cathedral defines The Pillars of the Earth. The Spanish Armada’s fire ships described in the book were something of a revelation to me, and provided a perfect background image to build the cover around. The clue is in the title for the final element of the design. Fire features heavily in this story; burnings at the stake, the Spanish fire ships, Guy Fawkes failed gunpowder plot, even the flame red hair of Queen Elizabeth I. Once I was happy with the basic design, the final stage was to set fire to it! Images of flames can be tricky both visually and practically, but the singed aftermath looks really interesting and is great fun to create. I set fire to lots of pieces of paper, photographed the best ones, then built up layers of these burn marks onto a parchment background in Photoshop. This produced the look I was after – the impression of an artefact salvaged from the wreckage of a 17th century fire ship. I got a bit obsessed with how the singeing wrapped around the cover and spine – the left edge of the book / right side of the spine is very pleasing on the final product. Once this design was finalised and approved, I also got the chance to revisit the previous books in the series - The Pillars of the Earth and World Without End. We updated these in line with the look of the new cover. Creating a period title treatment and embossed central icon for each. We then applied the same design approach to create artefacts rather than conventional illustrations. The Pillars of the Earth is intended to look like some kind of long-buried medieval architectural plan, with the central icon inspired by the incredible illuminated books of the period. World Without End looks like a piece of stone masonry – literally part of the finished Kingsbridge cathedral. The central icon on this cover is inspired by the intricate stone masonry of the period. In fact, elements of the World Without End image are built up from an actual piece of Canterbury Cathedral, owned by Ken Follett. I’m pleased with how they all turned out, but I had most fun creating the singed cover of A Column of Fire. I hope we’ve created something that readers will want to pick up and hold, but the simple design approach is also intended to help the three covers work as a set and stand out.